Osteoporosis is estimated to affect 200 million women worldwide – approximately one-tenth of women aged 60, one-fifth of women aged 70, two-fifths of women aged 80 and two-thirds of women aged 90. Of those, 9 million women are in USA alone. 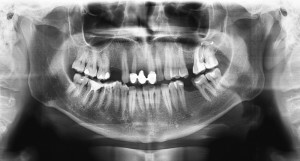 What does this have to do with dental implants? Well, with age, it has been shown that postmenopausal women are at greater risk of losing their teeth, entering a cycle of bone loss on her jaw and maxilla. 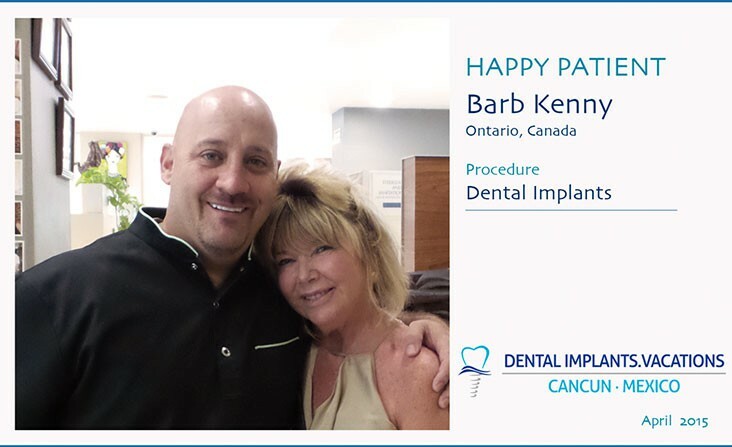 Barb Kenny is a wonderful lady from Ontario, Canada, that came to our dental clinic in Cancun for some dental implants. She’s a nurse and loves basketball. Barb knows that we import all of our materials from the States because Mexico doesn’t produce dental equipment. This is good for your because your will get all the same materials you would find back home but saving up to 70% of what it can cost on USA or Canada. Better to use that money to pamper yourself on an amazing vacation in the Riviera Maya! Dream of Falling Teeth? Overcome the nightmare with Dental Implants! The falling and crumbling teeth nightmare is one of the most common dreams shared by adults. There are many explanations for it, like stress, feeling impotent or lacking control, afraid of social interaction, growing old and more. Looking for a Dental Makeover? In April we had a visit from our good friend Lois Hartzog from Palm City, Florida. 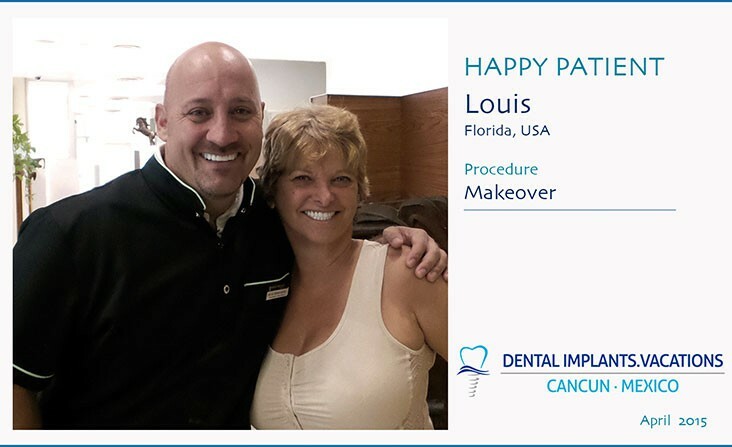 She first came to us back in 2013 to get a complete dental makeover and is still showing off an amazing smile. This time she came for a general check up and cleaning. As a very interesting anecdote… every time Lois has come, she has gotten a call telling she just had a new grandchild! We congratulated her and wished the best for her and the new members of her family. Let’s go back a little bit to thank a great couple who visited us. They are Sam and Everett Mason, from Virginia, who decided to get some snap in dentures together. When couples look for treatments at our dental clinic in Cancun we realize there’s a strong bond between them. They have taken an important decision to sport a new smile by the end of their vacation in Cancun. Couples such as them support each other and we always try to reassure them to make them feel comfortable. With Snap in Dentures you can eat, drink and have all the normal functions of a natural denture back. With snap on dentures, hiding smiles is a thing of the past! Snap in dentures in Virginia are really expensive. Why pay several thousand dollars when you can have your snap in dentures in Cancun and save up to 70%? Enjoying the beaches and all the activities in Cancun is a big plus! Don’t hide anymore. Call our agents toll free from the USA or Canada at 1-800-701-6039. You can even send you photos or x-ray on our contact page so our doctors can have a look and give you their preliminary diagnostic. 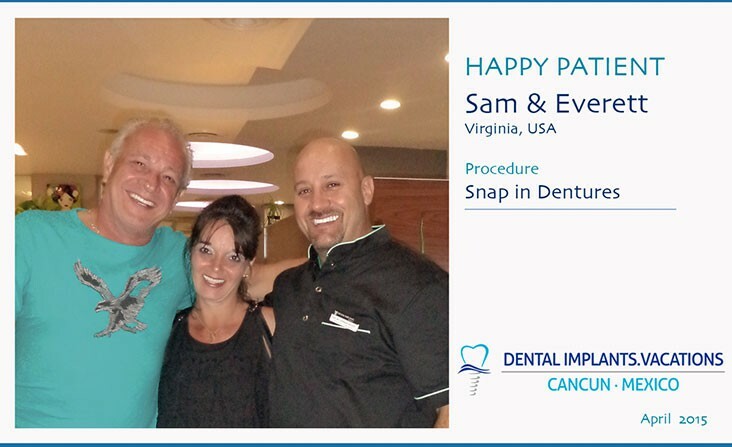 Gerry – Ambassador of our Dental Clinic in Cancun! 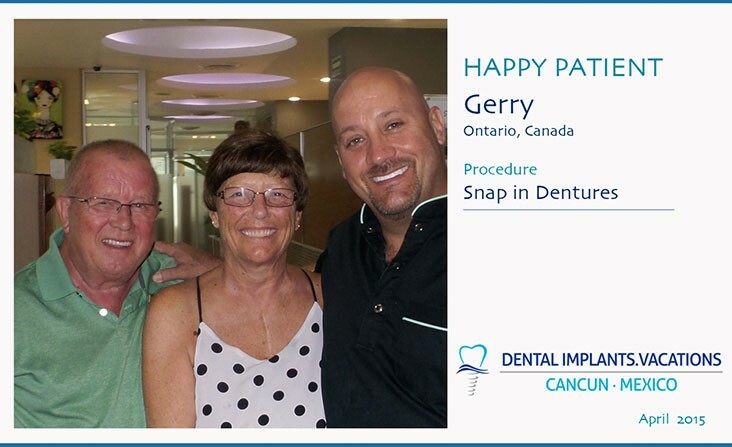 Gerry from Ontario, Canada visits Cancun every year with his wonderful wife to enjoy the white sand beaches, the amazing resorts and to have a dental check up with us. Years ago, when he first came to us, Gerry was looking for an alternative solution with his denture.